Until his dying day in 2014, Nelson Bunker Hunt, who had once been the world’s wealthiest man, denied that he and his brother plotted to corner the global silver market. Sure, back in 1980, Bunker, his younger brother Herbert, and other members of the Hunt clan owned roughly two-thirds of all the privately held silver on earth. But the historic stockpiling of bullion hadn’t been a ploy to manipulate the market, they and their sizable legal team would insist in the following years. Instead, it was a strategy to hedge against the voracious inflation of the 1970s—a monumental bet against the U.S. dollar. Whatever the motive, it was a bet that went historically sour. The debt-fueled boom and bust of the global silver market not only decimated the Hunt fortune, but threatened to take down the U.S. financial system. The panic of “Silver Thursday” took place over 35 years ago, but it still raises questions about the nature of financial manipulation. While many view the Hunt brothers as members of a long succession of white collar crooks, from Charles Ponzi to Bernie Madoff, others see the endearingly eccentric Texans as the victims of overstepping regulators and vindictive insiders who couldn’t stand the thought of being played by a couple of southern yokels. In either case, the story of the Hunt brothers just goes to show how difficult it can be to distinguish illegal market manipulation from the old fashioned wheeling and dealing that make our markets work. Whatever their foibles, the Hunts make for an interesting cast of characters. Evidently CBS thought so; the family is rumored to be the basis for the Ewings, the fictional Texas oil dynasty of Dallas fame. Sitting at the top of the family tree was H.L. Hunt, a man who allegedly purchased his first oil field with poker winnings and made a fortune drilling in east Texas. H.L. was a well-known oddball to boot, and his sons inherited many of their father’s quirks. Cheap suits aside, the Hunts were not without their ostentation. At the end of the 1970s, Bunker boasted a stable of over 500 horses and his little brother Lamar owned the Kansas City Chiefs. All six children of H.L.’s first marriage (the patriarch of the Hunt family had fifteen children by three women before he died in 1974) lived on estates befitting the scions of a Texas billionaire. These lifestyles were financed by trusts, but also risky investments in oil, real estate, and a host of commodities including sugar beets, soybeans, and, before long, silver. The Hunt brothers also inherited their father’s political inclinations. A zealous anti-Communist, Bunker Hunt bankrolled conservative causes and was a prominent member of the John Birch Society, a group whose founder once speculated that Dwight Eisenhower was a “dedicated, conscious agent” of Soviet conspiracy. In November of 1963, Hunt sponsored a particularly ill-timed political campaign, which distributed pamphlets around Dallas condemning President Kennedy for alleged slights against the Constitution on the day that he was assassinated. JFK conspiracy theorists have been obsessed with Hunt ever since. In fact, it was the Hunt brand of politics that partially explains what led Bunker and Herbert to start buying silver in 1973. The 1970s were not kind to the U.S. dollar. 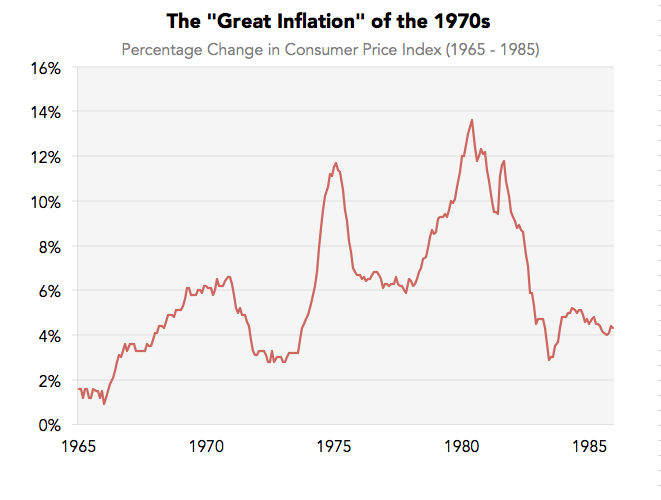 Years of wartime spending and unresponsive monetary policy pushed inflation upward throughout the late 1960s and early 1970s. Then, in October of 1973, war broke out in the Middle East and an oil embargo was declared against the United States. Inflation jumped above 10%. It would stay high throughout the decade, peaking in the aftermath of the Iranian Revolution at an annual average of 13.5% in 1980. Over the same period of time, the global monetary system underwent a historic transformation. Since the first Roosevelt administration, the U.S. dollar had been pegged to the value of gold at a predictable rate of $35 per ounce. But in 1971, President Nixon, responding to inflationary pressures, suspended that relationship. For the first time in modern history, the paper dollar did not represent some fixed amount of tangible, precious metal sitting in a vault somewhere. For conservative commodity traders like the Hunts, who blamed government spending for inflation and held grave reservations about the viability of fiat currency, the perceived stability of precious metal offered a financial safe harbor. It was illegal to trade gold in the early 1970s, so the Hunts turned to the next best thing. As an investment, there was a lot to like about silver. The Hunts were not alone in fleeing to bullion amid all the inflation and geopolitical turbulence, so the price was ticking up. Plus, light-sensitive silver halide is a key component of photographic film. With the growth of the consumer photography market, new production from mines struggled to keep up with demand. And so, in 1973, Bunker and Herbert bought over 35 million ounces of silver, most of which they flew to Switzerland in specifically designed airplanes guarded by armed Texas ranch hands. According to one source, the Hunt’s purchases were big enough to move the global market. But silver was not the Hunts' only speculative venture in the 1970s. Nor was it the only one that got them into trouble with regulators. In 1977, the price of soybeans was rising fast. Trade restrictions on Brazil and growing demand from China made the legume a hot commodity, and both Bunker and Herbert decided to enter the futures market in April of that year. A future is an agreement to buy or sell some quantity of a commodity at an agreed upon price at a later date. If someone contracts to buy soybeans in the future (they are said to take the “long” position), they will benefit if the price of soybeans rise, since they have locked in the lower price ahead of time. Likewise, if someone contracts to sell (that’s called the “short” position), they benefit if the price falls, since they have locked in the old, higher price. While futures contracts can be used by soybean farmers and soy milk producers to guard against price swings, most futures are traded by people who wouldn’t necessarily know tofu from cream cheese. As a de facto insurance contract against market volatility, futures can be used to hedge other investments or simply to gamble on prices going up (by going long) or down (by going short). When the Hunts decided to go long in the soybean futures market, they went very, very long. Between Bunker, Herbert, and the accounts of five of their children, the Hunts collectively purchased the right to buy one-third of the entire autumn soybean harvest of the United States. To some, it appeared as if the Hunts were attempting to corner the soybean market. In its simplest version, a corner occurs when someone buys up all (or at least, most) of the available quantity of a commodity. This creates an artificial shortage, which drives up the price, and allows the market manipulator to sell some of his stockpile at a higher profit. Futures markets introduce some additional complexity to the cornerer’s scheme. Recall that when a trader takes a short position on a contract, he or she is pledging to sell a certain amount of product to the holder of the long position. But if the holder of the long position just so happens to be sitting on all the readily available supply of the commodity under contract, the short seller faces an unenviable choice: go scrounge up some of the very scarce product in order to “make delivery” or just pay the cornerer a hefty premium and nullify the deal entirely. Even so, when the Commodity Futures Trading Commission found that a single family from Texas had contracted to buy a sizable portion of the 1977 soybean crop, they did not accuse the Hunts of outright market manipulation. Instead, noting that the Hunts had exceeded the 3 million bushel aggregate limit on soybean holdings by about 20 million, the CFTC noted that the Hunt’s “excessive holdings threaten disruption of the market and could cause serious injury to the American public.” The CFTC ordered the Hunts to sell and to pay a penalty of $500,000. Though the Hunts made tens of millions of dollars on paper while soybean prices skyrocketed, it’s unclear whether they were able to cash out before the regulatory intervention. In any case, the Hunts were none too pleased with the decision. “Apparently the CFTC is trying to repeal the law of supply and demand,” Bunker complained to the press. Despite the run in with regulators, the Hunts were not dissuaded. Bunker and Herbert had eased up on silver after their initial big buy in 1973, but in the fall of 1979, they were back with a vengeance. By the end of the year, Bunker and Herbert owned 21 million ounces of physical silver each. They had even larger positions in the silver futures market: Bunker was long on 45 million ounces, while Herbert held contracts for 20 million. Their little brother Lamar also had a more “modest” position. By the new year, with every dollar increase in the price of silver, the Hunts were making $100 million on paper. But unlike most investors, when their profitable futures contracts expired, they took delivery. As in 1973, they arranged to have the metal flown to Switzerland. Intentional or not, this helped create a shortage of the metal for industrial supply. Naturally, the industrialists were unhappy. From a spot price of around $6 per ounce in early 1979, the price of silver shot up to $50.42 in January of 1980. In the same week, silver futures contracts were trading at $46.80. Film companies like Kodak saw costs go through the roof, while the British film producer, Ilford, was forced to lay off workers. Traditional bullion dealers, caught in a squeeze, cried foul to the commodity exchanges, and the New York jewelry house Tiffany & Co. took out a full page ad in the New York Times slamming the “unconscionable” Hunt brothers. They were right to single out the Hunts; in mid-January, they controlled 69% of all the silver futures contracts on the Commodity Exchange (COMEX) in New York. But as the high prices persisted, new silver began to come out of the woodwork. According to a Washington Post article published that March, the D.C. police warned residents of a rash of home burglaries targeting silver. Unfortunately for the Hunts, all this new supply had a predictable effect. Rather than close out their contracts, short sellers suddenly found it was easier to get their hands on new supplies of silver and deliver. In financial terms, the brothers had a large corpse on their hands—and no way to bury it. This proved to be an especially big problem, because it wasn’t just the Hunt fortune that was on the line. Of the $6.6 billion worth of silver the Hunts held at the top of the market, the brothers had “only” spent a little over $1 billion of their own money. The rest was borrowed from over 20 banks and brokerage houses. At the same time, COMEX decided to crack down. 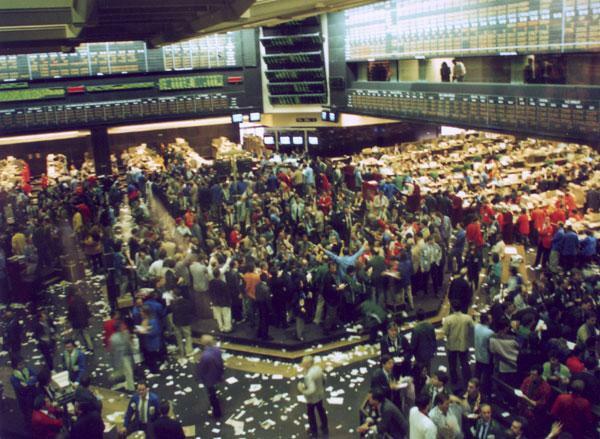 On January 7, 1980, the exchange’s board of governors announced that it would cap the size of silver futures exposure to 3 million ounces. Those in excess of the cap (say, by the tens of millions) were given until the following month to bring themselves into compliance. But that was too long for the Chicago Board of Trade exchange, which suspended the issue of any new silver futures on January 21. Silver futures traders would only be allowed to square up old contracts. Predictably, silver prices began to slide. As the various banks and other firms that had backed the Hunt bullion binge began to recognize the tenuousness of their financial position, they issued margin calls, asking the brothers to put up more money as collateral for their debts. The Hunts, unable to sell silver lest they trigger a panic, borrowed even more. By early March, futures contracts had fallen to the mid-$30 range. Matters finally came to a head on March 25, when one of the Hunts’ largest backers, the Bache Group, asked for $100 million more in collateral. The brothers were out of cash, and Bache was unwilling to accept silver in its place, as it had been doing throughout the month. With the Hunts in default, Bache did the only thing it could to start recouping its losses: it start to unload silver. On March 27, “Silver Thursday,” the silver futures market dropped by a third to $10.80. Just two months earlier, these contracts had been trading at four times that amount. After the oil bust of the early 1980s and a series of lawsuits polished off the remainder of the Hunt brothers’ once historic fortune, the two declared bankruptcy in 1988. Bunker, who had been worth an estimated $16 billion in the 1960s, emerged with under $10 million to his name. That’s not exactly chump change, but it wasn’t enough to maintain his 500-plus stable of horses,. The Hunts almost dragged their lenders into bankruptcy too—and with them, a sizable chunk of the U.S. financial system. Over twenty financial institutions had extended over a billion dollars in credit to the Hunt brothers. The default and resulting collapse of silver prices blew holes in balance sheets across Wall Street. A privately orchestrated bailout loan from a number of banks allowed the brothers to start paying off their debts and keep their creditors afloat, but the markets and regulators were rattled. The trouble was not over for the Hunts. In the following years, the brothers were dragged before Congressional hearings, got into a legal spat with their lenders, and were sued by a Peruvian mineral marketing company, which had suffered big losses in the crash. In 1988, a New York City jury found for the South American firm, levying a penalty of over $130 million against the Hunts and finding that they had deliberately conspired to corner the silver market. Surprisingly, there is still some disagreement on that point. Bunker Hunt attributed the whole affair to the political motives of COMEX insiders and regulators. Referring to himself later as “a favorite whipping boy” of an eastern financial establishment riddled with liberals and socialists, Bunker and his brother, Herbert, are still perceived as martyrs by some on the far-right. Though the Hunt brothers clearly amassed a staggering amount of silver and silver derivatives at the end of the 1970s, it is impossible to prove definitively that market manipulation was in their hearts. Maybe, as the Hunts always claimed, they just really believed in the enduring value of silver. Or maybe, as others have noted, the Hunt brothers had no idea what they were doing. Call it the stupidity defense. “They’re terribly unsophisticated,” an anonymous associated was quoted as saying of the Hunts in a Chicago Tribune article from 1989. “They make all the mistakes most other people make,” said another. In their civil trial against the South American mineral firm, the Hunt brothers’ decision to begin accepting delivery on their enormous holdings in silver futures was considered a red flag. A market participant would only take the actual metal, rather than cash in on highly profitable futures contracts, if their plan was to remove the bullion from circulation and artificially inflate the price. That decision, it was argued, was consistent with market manipulation. But one could argue that it is also consistent with having an irrational fixation on shiny metal and way more money than sense. In his New York Times obituary in 2014, it was reported that towards the end of his life, Bunker Hunt had scrounged up enough to start buying horses again. Our next article explores how women's turnout for presidential elections has increased since the 1960—and why Trump would beat Hillary handedly if it hadn't. To get notified when we post it → join our email list. The cover image comes from Dnn87.